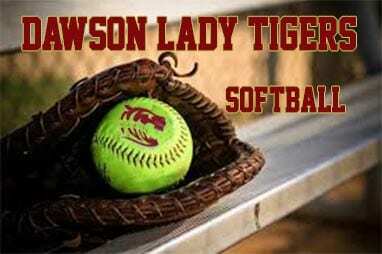 The Lady Tigers of Dawson County (4-9 over all and 2-5 in region) hosted the Indians of Lumpkin County (12-3 over all and 4-1 in region) on Tuesday for a region game. Facing a good team in the Indians the Lady Tigers were almost desperate for a victory. The first inning had both the Indians and the Lady Tigers putting up one run in their half inning respectively. The Dawson run came by way of a Carol Drake single and stolen base. Drake would score on a ground ball out by Maggie Schandera. The third inning would tell the story of the game with the Indians scoring 3 times and taking the lead that would give them the victory. The Indians added 2 insurance runs in the fifth and another in the sixth for a 7-4 region win. The Lady Tigers fought adding 2 in the forth and one in the sixth but came up just 3 runs short in the loss. Dawson hitters had 7 hits in the game facing a strong pitcher in Natalie Robinson. Robinson threw 89 pitches allowing 4 runs(1 earned) on 7 hits, 2 strikeouts and 3 walks. Providing the offense for Dawson were Carol Drake, Brandi Williams, Maggie Schandera and Tori Martin each with one hit. Olivia Martinez had 3 hits in the game. Maggie Schandera stepped in the circle for the Lady Cats going all 7 innings. Schandera took the loss throwing 91 pitches allowing 7 runs with 3 of those earned, 8 hits, 2 strikeouts and 1 walk. 75 of her 91 pitches were strikes. With this 7-4 loss, Dawson heads into their home game against region opponent Greater Atlanta Christian on Thursday September 13, 2018. Game time is set for a 5:55 PM first pitch.